I just got the CD of Austin photos from my brother, so get ready for some boring slide shows. I have a lot to go through, though, so you have a little bit of a breather. I didn't knit much today. I guess for me, like everyone else, the new year leads to thoughts of completion and cleanup. To that end, I pulled out a three-quarters finished cardigan in Jaeger Matchmaker Merino Aran, a yarn that seems to have been discontinued, I'm sorry to say. It's a beautiful yarn but it just wasn't happening for me in the pattern I was using. So I threw it in a box and forgot about it for a couple of years. It's a pretty rose pink color. And then for no good reason that I can think of, it popped into my head this morning. Something along the lines of: "This would be a good day to rip out the Jaeger Matchmaker cardigan and straighten out the yarn." Here it is on the drying rack. Yep, those are all cookbooks on both of those bookshelves. There are some more stacked up against the wall around the corner. 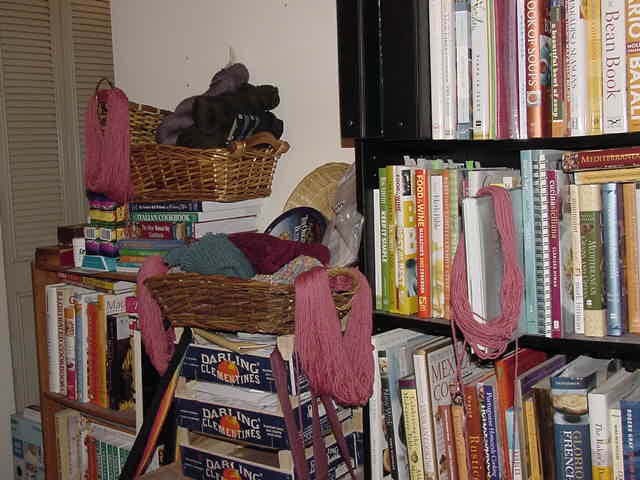 The yarn is in the bedroom and you won't be seeing any pictures of that disaster area anytime soon. I think I may have mentioned that none of my friends has seen my apartment for a long time (and some have never seen it). This crowded little corner should give you some idea of why. 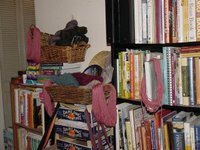 When your two main obsessions are books and knitting, things accumulate pretty quickly. I'm making some progress, though. I want Santino to go away. He's so obnoxious, and is a designer with one idea. I think the chaos that he creates is the reason he's still on. I'm picking Daniel V. for the win. I picked last season's winner half way though. It's my favorite tv show! Santino NEEDS to go. I love Daniel...all except for when he wears his hair in the faux mohawk thingy. What was Santino thinking with that costume yesterday? "Oh please make my back end big with feathers so when I spin I can really fly." Debi, you need to have guests over to your place. It doesn't look that bad from that one picture. Really. There is a new FashionSwat - They should do a Project Runway Swat.